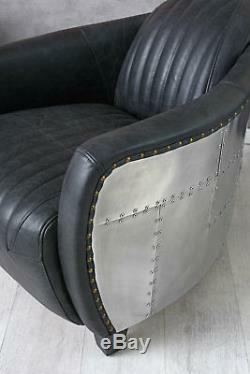 Aviator armchair Black Real Leather Aluminium Aeroplane Designer. The description of this item has been automatically translated. 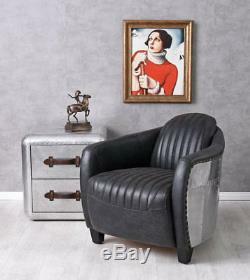 Aviator Chair black leather leather armchair aluminum aircraft designer arm Lake chairs. Real leather Club Chair leather chair loft Chair leather vintage cocktail chairs antique. AVIATOR ARMCHAIR ART DECO CLASSIC AIRCRAFT ALUMINUM External dimensions width approx. 40 cm x height74 cm x depth OSTEO. Inside: Seat height 42 cm, seat width 54 cm, seat depth 56 cm without decoration. 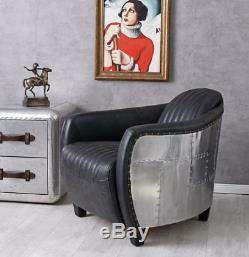 AVIATOR CHAIR ART DECO CLASSIC AIRCRAFT ALUMINIUM. A classic of the "roaring twenties". 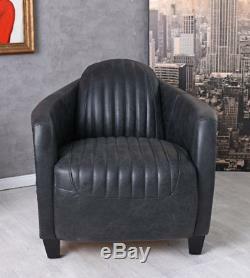 Traditionally-designed Club Chair made of thick, durable leather. With decorative Aero metal plates in the DC3 clad style. Comfortable and timeless it presents itself exclusive classic in any environment. The chair is made in vintage look, color differences, abrasions and cracks. Underline the elegant appearance of the solitaire furniture. Innen: seat height 42 cm, seat width 54 cm, seat depth 56 cm. Alternatively, you can pay on the spot. Palazzo int is a Wholesale and retail for historic facilities of all kinds. Our range of products ranging from small home accessories, extravagant gifts up to stately and trendy home design ideas. To our Best sellers include sculptures, "Poly stone" sculptures, oil paintings, lamps, mirrors, fountain, porcelain, furniture for home and garden, home textiles such as fur blankets, curtains, pillows and much more. Furniture & decorations in Indus trial design. Sofas, armchairs, living landscapes & beds. Is your competent supplier for Furniture and decorations in the trendy vintage style. Design & Development by Pixel Safari. Designklassiker - 20er & 30er. The item "Aviator armchair Black Real Leather Aluminium Aeroplane Designer" is in sale since Monday, May 28, 2018. This item is in the category "Home, Furniture & DIY\Furniture\Sofas, Armchairs & Suites\Armchairs". The seller is "palazzo24-de" and is located in Gelsenkirchen, NRW. This item can be shipped to European Union member countries.